ECs Note: Here are three more stories written by Captain John Bogan, owner and operator of the f/v SHAMROCK out of Pt. Pleasant New Jersey. We ask for you to comment within a page I will be setting up in the forums about these stories and others written by Captain John Bogan. You are welcome to ask questions and make comments. This next group of stories, go back to the war and post-war time period…..we hope you enjoy them. I am positive if I had never seen the certificate on the wall thanking my father forhis service, the Eastern Sea Frontier or ESF would be a mystery. The ESF was a divisionof the United States Navy. The key goal of the ESF was to have coastal watches alongthe entire eastern seaboard with one sole purpose in mind- spotting U boats. The year was 1942 and all merchant ships were sent guidelines to follow toavoid German U boats. Each ship was required to have a minimum of four lookoutsposted. The day and night time passages were to be done in a zigzag pattern with courseschanged frequently. No lights were allowed on board. This came about after severalships were blown out of the water. That’s not to mention any light on shore lit themerchant ships up like ducks in a shooting gallery. In addition every ship was required tomaintain radio silence except in extreme emergency. It was war and along the way, new ideas were added to the list. Unfortunately thenew rules were implemented after great losses. These losses occurred after the ship hadbeen torpedoed. One rule was, “If you are torpedoed, make sure you have stopped theship’s forward movement and shut the engines off. Take all the way off your vesselbefore abandoning ship.” Men had escaped the fiery inferno that once was their ship,only to be run down when believing they were safe. Safety equipment meant to save lives was found to be as explosive as the crudeoil the ships carried. Water lights that were calcium-carbide were removed. It wasdiscovered from survivors that these lights caused the oil in the water to ignite, causingseveral deaths. My father, Captain Jack Bogan, operated a party boat, the Columbia, for ourcousins in Brielle, New Jersey. After the outbreak of the war these vessels were notallowed to take passengers offshore to fish. They were permitted to fish commerciallywhen they were not on patrol duty. Dad went on patrol and also served as the ‘Press’boat from time to time. The night of February 27, 1942 started off well for mom and dad. They weretaking in a movie in nearby Manasquan, New Jersey, when the PA system squawked hisname at a loud pitch. Dad was given word that a ship had been torpedoed off SpringLake, New Jersey. The ship, the R.P. Resor had been traveling from Houston, Texas, bound for FallRiver, Massachusetts. The ship was loaded with nearly 80,000 barrels of crude oil. Oneof the lookouts had spotted what he thought was a fishing boat, as he saw the red andgreen running lights. He reported his sighting to the bridge. It was no fishing trawler,but it was a ploy the German U boats often used. It enabled them to get within 200hundred yards of the fully loaded tanker. The first torpedo struck amidships. The secondruptured and ignited the oil, the ship, and the surrounding water. The Resor had been in one of the designated shipping lanes, but by the time myfather got out there with a load of photographers, the ship was 8 miles from shore due toa strong wind from the northeast. The photographers got some great shots of the burninginferno. Some of the Press people wanted dad to get a little closer. He said, “The intenseheat nearly took your breath away.” Yet, he inched a little closer. It was not until afterreturning to the dock that he discovered he may have been a little too close. Every squareof paint was charred or discolored at or near the bow. The R.P. Resor carried a crew of 41 and had 9 armed naval guards on board at thetime of the torpedoing. Only one crewman and a guard survived. The commander of theCoast Guard boat that rescued the men estimated they weighed nearly 600 lbs. each. Thisafter the men and their clothing were drenched in an oil choked sea. The ship stayed afloat and continued to burn for two days. Crowds watched thesmoke and flames from the beach. The USS Sagamore, a navy tug was dispatched andmade a futile attempt to tow the ship to port. The tow line snapped and the R.P. Resorsettled stern first beneath the waves. Her final resting place is in 130’ of water. Dad never saw a single sub. His cousin, John, once saw the running lights of asub as it submerged Capt. Bob Zeigler on the Diana saw two subs several milesoffshore, but never got near enough to see much more than their shapes. Dad and his mate were out with set lines for codfish one winter day and saw anavy ship steam about two miles south of where they were fishing. It was a beautiful daywith calm seas, but the fish were not cooperating. The navy ship dropped a series ofdepth charges very near a wreck known as the Mohawk. The Mohawk had sunk in acollision with the Norwegian freighter, the Talisman in 1935. Dad later learned the navyship thought a U boat was sitting on the bottom next to the wreck. Even though theColumbia was 2 miles away dad said as each depth charge blew, the Columbia seemed torise out of the water and shutter.After the navy ship vacated the area and steamed to the distant horizon, dadsteered his vessel two miles to the south. There was no oil or debris field, but there werefish, a lot of fish floating belly up on the surface. Dad and his mate, Lou began nettingthe stunned fish and thanks to the navy had a fine day. It is amazing how one false step or wrong pronunciation of a word can pin a name on you. That small blunder will allow you to get stuck with a name you may not relish for your entire life. Now, being called ‘handsome’ or ‘lucky’ wouldn’t be bad, but there are worse. I knew a fellow that got stuck with two names. The first was ‘Fleet Commander,’ which to this day brings a smile to my face. He did own several vessels and even the best one, his pride and joy, was in deplorable condition. If it were not for several good quality bilge pumps working at a feverish pace, that boat would have sunk several times each day. In the end, that’s exactly what happened. But the ‘Fleet Commander’ was not on board. Naturally he blamed the man he had hired. In reality his boat was living on borrowed time and luckily no one got hurt. His boat went down in a flash and instead of putting up a gallant fight, she sank like a stone. Two lone planks were all that washed ashore. If I got stuck with the name of ‘Captain Crunch’ I’d pull up stakes. The fellow had the wrong interpretation of exactly what a piling was used for. Captain Crunch had everyone’s rapt attention whenever he pulled up to a dock. There were always a few rookies on the dock that were not up on the ‘local lore.’ They knew little or nothing of the infamous skipper’s exploits. Most were high school kids working part time. And in the dead of winter they were now wondering when the bright idea hit them to work at unloading and then packing fish in wooden boxes, to be shipped to all points of the compass. They were easily spotted. They were the ones that had no boots, wore no hats, and had sneakers with a dozen holes in them. Their feet were constantly wet. The only time they felt their feet was when they departed their parent’s warm cozy car. Most of these kids never finished a week of work. But a few had stories to later tell their kids or grandchildren. In the rendition of their first encounter with Captain Crunch, the listeners were easily drawn into the story. It read like a scene straight from “Jaws.” In their tale it was not a shark, a killing machine with razor sharp teeth. Maybe their adversary was not something some movie producer dreamt up in his spare time. Make no mistake, this was real, something that could be seen and touched. All of us veterans or dock rats, although I was only 15 at the time, stood what we deemed a safe distance from the mayhem we knew was about to happen. We believed there was no sense trying to tell the rookies about Crunch. 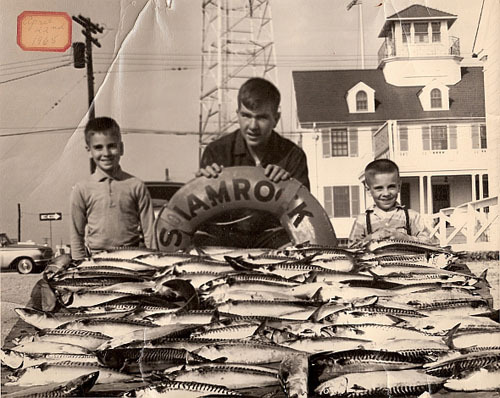 It was the norm that each one of those kids knew all there was to know about packing fish and how the dock should run after a mere two hours of work. If Captain Crunch was one thing, he was consistent. He had no business running a boat. He was one guy who never learned from his mistakes. In his mind, it was never his fault. He did not single out pilings and docks, but boats as well. It could only be deemed as ‘rotten luck’ to be off loading your catch when he came around the bend near Inlet Diesel. The kids in small groups were more into talking and lighting their cigarettes than watching Captain Crunch make the turn and head to the section of dock where they stood. There was little or no camaraderie as one young man’s only warning to his buddies was, “Oh my God.” It was every man for themselves. The tell tale puff of smoke belched out of a rusty exhaust pipe as Crunch tried to stop, then back the vessel at a high rate of speed. A cluster of three pilings snapping echoed across the narrow slit of water as a single report from a high powered rifle. Captain Crunch exited the wheelhouse unfazed. He cited a sticky throttle cable as the culprit and not his ineptness at operating a vessel. A few of the young men never returned and the ones that did, never again saw Captain Crunch. He was told to take his fish and boat elsewhere after his most recent encounter with the pilings. I did hear rumors of his exploits, but they were just that, rumors. The truth is he got out of fishing and turned to running drugs. He fared far worse as his bullet riddled body was found in the trunk of his car a couple of months after he got out of fishing. My father had captained boats all his life. He never had a new boat. When he got a boat it was pretty well worn out. His first boat was called the American and he operated out of Broadway Basin in Point Pleasant Beach, New Jersey. A few years before he purchased the boat, it had turned over entering the Manasquan Inlet. The American was a typical party boat for the time. She was forty-five feet in length and was built by Johnson Brothers Boat Works in nearby Bay Head, New Jersey. She was severely underpowered. She had a 371 Detroit diesel. Most boats had either one or two 671 Detroit engines, which gave them a fair amount of speed for the day. A friend of dad’s had started to build a boat in Atlantic City, New Jersey. For some reason, he backed out and that is when dad stepped in. The year was 1953 and his new boat the “Shamrock” was completed. The Shamrock was the first flush deck party boat built. In essence it meant that the cabin and toilets were on deck. Many an unwary passenger often got a bad case of the dreaded ‘Atlantic Flu.’ In other words, they got seasick. People often spent the entire trip below on the old 45’ boats and never budged from below deck until the vessel returned to port. The windows in the pilothouse all opened. The center window had a copper tray that the bottom of the window sat on. It also was a convenient bank for dad for a number of years. He did not drop just any coin down the center window. For a time the fare to go fishing often would be $2.50, $5.50, and so on. Well it seems dad would drop a Liberty half dollar down the window whenever he had a good crowd on board. After one summer he decided to open his bank. Ironically there had just been a big blow as a hurricane skirted the coast. The inlet was impassable as there was a huge swell running. Every captain and crew was catching up on maintenance or on a raft cleaning and scrubbing the hull of their vessel. Dad though set to take the window apart. Dad did not count on the copper tray turning green from the salt that seeped unabated through the window. In turn many of the coins got a good dose of salt water and also turned green. Some appeared to come straight from the ocean. Dad put the coins in two five gallon buckets and headed for home. He made one stop at a local shop that did engine work and welding. He had the two buckets in back of his truck and the coins caught the eyes of the two men he was chatting with. Each picked up a handful of coins and when they slid out of their hands back into the buckets and made a heavy clink sound one man Bob asked excitedly, “Jack, where did you get all these coins?” Dad did not want to go into detail about the window on the boat so he said, “I went down to the beach near the inlet in the little cove and the coins were lying all over the place.” To cover himself he told them he heard a buddy tell of all the clams that had washed ashore after the big blow. Each man made an excuse about getting back to work and dad while exiting the driveway was nearly run over by the men as they sped to the beach for their buckets of silver coins. Dad drove the five miles home with a huge smile on his face. The nosey neighbor who lived a few houses away also was taken in by a similar story from dad. My mother could only laugh as the woman always appeared to have one speed. She too disappeared in a cloud of dust. The whole family got the job of cleaning the coins. Some came out as if they had just been minted, and others remained green and crusty. The final tally was close to $900.00. Eight hundred of it was used to buy a ‘state of the art’ RCA color TV. The two mechanics and the neighbor came up with nothing other than sore backs and wet feet. To this day it is the largest pile of silver dollars I have ever seen. In today’s market it would be a small fortune.